You are here: Home / News / Room types in Excellence Riviera Cancun Puerto Morelos? 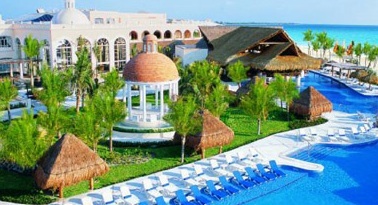 Room types in Excellence Riviera Cancun Puerto Morelos? Beaches will always hold special reputation in a country like Mexico. People visiting this country prefer to have beach front rooms so that they can just walk right out onto the beach. One such vacationer wants to know whether there are rooms in Excellence Riviera Cancun Puerto Morelos which provide such kind of luxury. Also wants to know about the roof top terrace rooms and the swim out rooms of the resort. There are no ocean front rooms available as they have a pool, bar, sunbathing terraces between the beach and ocean. However there is a section in the resort called Ocean View in the Excellence Club section. Both the swim up and roof top terrace rooms are great options to be available at the resort. The resort is a favorite among most vacationers and they had great time there.